This handbag is a two tone gold. It is 3 3/4 in. tall not including the knob on top. Across the bottom it is 4 1/2 in. 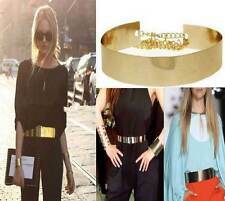 The chain strap drop is 22 in. Titled "Sativa".the Cannabis sativa, a plant with long stem and narrow leaves. This buckle has been worn and aged naturally, very good condition. Vintage Wicker Handled Handbag With Pansies, Gold Lining, Excellent. Great shape. Bright gold lining and zipper pocket excellent. Clasp works smoothly. Green braid lines the top, unbroken. Pansies made of velvet with fabric leaves, slightly faded but no losses that I see. Handles excellent. Wicker bright. dimensions 9.5 x 6 x 6 inches. Maximum height handles 6 inches. In my pet and smoke free home for many years. I love it but am downsizing. Beautiful Gold beaded antique purse. There are no missing beads and all the beads are tight. (there are a few of these beads missing from the top trim. ). Interior is clean satin and purse still has the original mirror covered in matching satin. 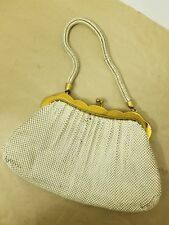 Antique Art Deco Whiting & Davis Gold Mesh Purse / Evening Bag. Shipped with USPS Priority Mail. Excellent condition! Thank you for viewing. Clam Shell Evening Purse Gold >>>> Very Nice Condition<<<<<. As shown used normal wear. You will see reflections in the glossy surfaces. The top, bottom, and Lucite handle are a beautiful dark amber color. The satin look cloth interior is a lighter amber shade. The lining is unmarked but from online comparisons, we are quite certain that it was made by DORSET REX - FIFTH AVENUE in the 1950's. Nice Whiting Davis bag. Minor scratches on the trim of purse. Otherwise nice bag for its age. Scrimshaw Style. Marked 1981. Solid Brass. Purse overall is in good condition for its age. 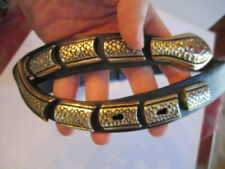 It is missing 1 rhinestone on the latch, and small tarnish spots by latch, other than that great shape for its age. 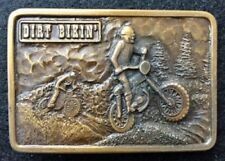 Brass Military Style Belt Buckle. Estate Liquidation. Pre-owned, Never Worn. This bag has been very gently used and is in very good condition. About 6 1/4" at widest point and 6 1/2" from top to bottom. Shoulder chain. Faille lining with inside pocket. Crystal trim. Kiss-lock closure. The bag does not lock. Inside of bag is intact. 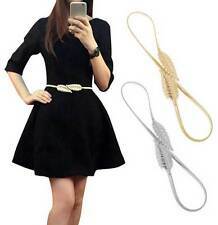 It has a clasp that is secure with a nice snap to it. The color of all of it is like my first photo. A deep gold tone. GILLI OF NEW YORK LUCITE PURSE - ORIGINAL - VERY NICE!! This purse is clean, has no cracks but does have a little discoloration or fogginess in the lid. The clasp works and it has a Gilli of New York label inside the lid. The pattern is a gold marble look with streaks of gold. Art Deco Sterling Silver & Gold Napier Belt Buckle Monogram "S"
Loose on left side bottom with rim - see last pic but this is a heavy, nice piece. We try to describe them to the best of our knowledge. Good Luck! 45mm x 31.5mm. Body of bag is approx 9" x 7". Vintage Whiting Davis Gold Mesh Hand Bag. Shipped with USPS Priority Mail. This is a older hand bag. It is used and has some wear but overall not to bad. Check pics for questions good luck. Hello Everyone! It is in very good condition, clean inside with velvety felt like lining. This purse was manufactured by Mandalian Mfg. Co.
Vintage Whiting Davis Gold Mesh Hand Bag. Shipped with USPS Priority Mail. This hand bag is older piece. Has some wear but overall pretty good used condition. Check pics for questions good luck. Made In France. Gold/white Tone. Number marking in inside pocket. See photo otherwise excellent condition. The stitching on the sides is starting to pull away and there is a 1/2" section at the bottom that needs repair. An easy fix. The interior satin lining is old and starting to tear in spots. The gold rick rack that holds it in place is in good condition! ANTIQUE BEADED PURSE with LONG FRINGE. CONDITION : Beading on the body is secure. For your consideration, a gorgeously hand stitched and detailed beaded purse featuring long fringe. The body features gold beading with a small amount of silver. This purse is bean/oval shaped with a gold glitter lucite top, bottom and handle with brass hardware. The interior lining is a peach taffeta. ( excellent interior condition). Marked MW Handbags, USA. For once, an evening bag that isn't so tiny! Nice and clean inside and out. This bag is c. 7-1/2" wide and 5" tall. AND LINK CHAIN HANDLE. NOTE: lining loose on one side. Weighs 3.2oz. Overall condition is excellent. VINTAGE, SOLID BRASS, BELT BUCKLE, from TIFFANY STUDIO, Pontiac, Auto, 70's. Shipped with USPS First Class Package. Vintage 1950s / 1960s Fuji Beaded Box Bag Purse Handmade. Fully beaded with gold details and cream fabric lining with mirror inside. Believed to be from the 1950s to 1960s. There are scratches in the metal as shown, and some tarnishing as well. There are some stains on the fabric. A few beads are missing on the strap, bottom, and back of purse. I have provided pictures of all imperfections. I don’t think these things take away at all from the beauty of this unique purse. Size is 4 1/4" x 4 1/2" x 3 1/2".